Document E36/254, which is kept in the National Archives at Kew, records the horses distributed after the Battle of Flodden (1513), from Gilcamyn in Cumberland and from Morpeth in Northumberland. It also gives the name of each recipient, where they came from, and in some cases their social standing. For example, some are recorded as ‘servants of ’ or ‘belonging to’ named nobles or gentlemen. It also gives a detailed description of the type, colour and condition of each horse. The document gives great detail about who received the horses and the villages, parishes and manors they came from, allowing us to map out where the horses went after the battle. The references to the nobility gives some indication as to who provided troops in support of Henry. The types of horses distributed, and their descriptions can give us some insight into the condition of the horses after the battle. This document which was transcribed as part of the Documentary Research project answers many questions but poses more. Whilst transcribing, the following questions came to mind. What type of horses took part in the battle, were they involved in the fighting or were they just part of the train? In this period horses were a valuable asset, the ‘spoils of war’, to be shared out among the victors whatever their condition. The document shows that after the battle, the many horses that were left ownerless were distributed to members of the winning army. The horses are individually described in great detail, noting physical features (including injuries), markings and the type rather than the breed, as was the custom in this period. In the 16th century horses were described by type rather than by breed. Types such as Destriers, Rounces, Coursers and Palfreys were prized by knights and men-at-arms as they were easy to train for war, and they were strong, fast and agile. Rounces were also used as pack horses. Ambling, Jennets, Hobby, Trotting, Rakking (Racking) Horses and Nags2 tended to be chosen when the rider needed to cover long distances in relative comfort. In the document, horses were also described according to their gender as either mares (female), or geldings (castrated male horses), which tended to be quieter, gentler and more suitable as an everyday working animal. There were only four horse types mentioned in the document: - Ambling Horses, Rakking Horses, Trotting Horses and a Powys Pony. All these horse types were ones which generally had a calm temperament and would allow the rider to cover long distances in relative comfort. This suggests that the original owners of the horses had ridden long distances to get to the battlefield. With the exception of the one Powys Pony3 each of the other types were described as geldings, horses, mares or nags. The lack of ‘war horses’ could be significant. Physical features/condition of the horses. In the document the horses are described according to colour, markings and physical deformities such as cuts, burns, or sores. Many of the horses have cut, torn or bitten ears. Some have burns or sore patches on their buttocks, lower leg and back. This may suggest that many of the horses had been involved in the battle. Many of the horses were described as ‘Bausand’ (Bausouned, spelling varies in the original text) which according to the English Dialect Dictionary, is a horse which has a face streaked with white. Other interesting words and phrases were used to describe the colour of the horses, for example ‘cloudy faced’, ‘wall eyed’, ‘mealy mouthed’4, ‘grisseld’ and ‘pied’ (white with black spots5) being but a few. The colour of each horse was also described in some detail. Greys for example were described as – grey, white grey, dimly grey, dun grey, iron grey, dark grey, bright grey, dappled grey, freyned (streaked) grey and murky grey. As well as brown, black and white the other main types of horses were ‘bays’ (a horse with a reddish-brown body, a black mane, tail, ear edges and lower legs) and ‘duns’ (written ‘dwn’ in the original text). Dun horses have a sandy/yellow to reddish/brown coat. Their legs are usually darker than their body and sometimes have faint “zebra” stripes on them. Dun horses always have a “dorsal” stripe, which is a dark stripe down the middle of their back. Sometimes the dorsal stripe continues down the horse’s dock and tail, and through the mane. Many dun coloured horses also have face masking, which makes the horse’s nose and sometimes the rest of the face a darker colour than the horse’s body. Much of the description concerns injuries or blemishes present on the horses. Of the 301 horses listed in the original document, 63 (21%) are recorded as having some form of injury or damage probably sustained on the battlefield. 43 (68%) of these injuries relate to damage sustained to either one or both ears (nere side - left, ferr side - right). Many of the horses are described as having under-bitten, cut (stowed), ripped or torn ears. In some cases one or both ears have been completely cut off! Much of the horse armour of the time left ears exposed, so these types of injury are an expected outcome if they had taken part in the battle. The large number of ear injuries suggests that those horses, 12% of the total number, were ridden into battle and were injured as a result of the fighting. Where were the horses distributed from and to? This documents lists two places of distribution, Gilcamyn in Cumberland and Morpeth in Northumberland. The document lists 225 horses and mares being delivered at Gilcamyn in Cumberland, of these, 6 died before they could be allocated. 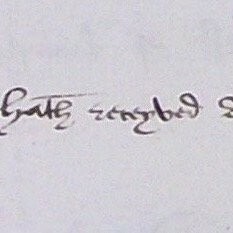 On 16th November (year unknown but probably 1513) there were still 12 horses to be delivered. Not all the page totals in the original document agree with the number of horses listed, this number (225) is two more than the entries listed. Was this a clerical error? How did the horses get from Flodden to Gilcamyn? This is a difficult question to answer, as despite much research, its location is still in some doubt. The document states that it is in Cumberland, but how did they get from Flodden to Cumberland? It seems unlikely that their route would have taken them west through Scotland as this would have led to more skirmishes between the two sides. The most likely route away from the site of the battle would have been southwards towards Alnwick, along the route of the present A697/A1, then south westwards towards Rothbury, Otterburn and Corbridge along the route of the modern day B6341. At this point they could turn westward along the route of the present A69 and A689 to Alston and a village called Garrigill, anciently called Gerardegile, Garrigill Gate and Gerard’s Ghyll. This area, known as the Manor of Alston Moor, was held by the Radclyffe family who became the Earls of Derwentwater in 1688. It is on the border between Cumberland and Northumberland, between Appleby and Penrith. This would be a central location allowing easy access to the east or west. Lancashire 12 (5%); Westmoreland 9 (4%); Cumberland 68 (30%); North Wales 5(2%) and 120 (53%) went to eastern counties: - Northumberland 11 (5%); County Durham 23 (10%); Yorkshire 86 (38%). The destination of 11 (5%) horses is unknown. In the second batch of horses distributed from Morpeth, 76 are listed. As Morpeth is at the end of the present A697, a road which runs directly from Branxton (Flodden) to Morpeth, it seems likely that the horses were led along this route, from the battlefield, to their distribution point. On first looking at the document it was assumed that the horses distributed from Morpeth would all be sent to locations in the east of the country? This in fact was not the case. Of the 76 horses delivered at Morpeth 17 (22%) of the horses went to western counties: - Lancashire 8 (11%); Westmoreland 1 (1%); Cumberland 8 (11%); and 41 (29%) went to eastern counties: - Northumberland 7 (9%); County Durham 6 (8%); Yorkshire 27 (36%); London 1 (1%). The destination of 18 (24%) of the horses is unknown. In conclusion, one set of horses, the smallest, was delivered from Morpeth on the east coast. Of the 76 horses delivered at Morpeth, 22% went to western counties and 29% went to eastern counties. The destination of 18 (24%) of the horses is unknown but it seems likely that they went to both eastern and western counties. Of the 225 horses delivered at Gilcamyn, 42% of the horses went to western counties and 53% went to eastern counties. The destination of 5% of the horses is unknown but again it is likely that they were sent to both eastern and western counties. The location of Gilcamyn is still in some doubt, is most likely to be south of Hadrian’s Wall. The village of Garrigill, anciently called Gerardegile seems the most likely candidate. Was the distribution point determined by their final destination? On first inspection of the document it was assumed that horses delivered at Morpeth would go to the eastern counties and those delivered in Cumberland would go to western counties. This was not the case however, horses seem to have been distributed to all northern counties from both locations. This distribution is not surprising as many of the lords mentioned in the document had land holdings across the north. Did the topography of the land and/or national boundaries determine the routes taken on the way to the distribution points? It is unlikely that the route taken by the horses would have crossed the boundary between Scotland and England as this could have led to skirmishes between the two sides. It is also unlikely that the groups would have tried to cross the Cheviot Hills, as many of the horses were already in a poor condition. Hence, the most likely route away from the battle field would have been southeast towards the east coast. The smaller group then continuing south towards Morpeth, the larger group cutting westwards towards Rothbury, Otterburn and Corbridge at Alnwick, along the route of the modern day B6341. At this point they could turn westward along the route of the present A69 and A689 to Alston and a village called Garrigill. The only proof we have for the location of Gilcamyn though is that the document says it is in Cumberland! How far south were the horses sent? One went to Lambeth in London with a servant of Henry Gray, the Earl of Kent’s brother. A second horse went to Ruthin, Denbighshire in north Wales, with a servant of Sir Grey of Ruthin, later the 3rd Earl of Kent. The third horse went with John Skelton, servant to Thomas Berkley of Mangotsfield in Gloucestershire. What was the condition of the horses at the time of distribution? Of the 301 horses listed in the original document 21% are recorded as having some form of injury. 68% of these injuries relate to damage sustained to either one or both ears. Much of the horse armour of the time left ears exposed so these types of injury are an expected outcome if they had taken part in the battle. The extract below describes the condition of the horse given to Richard Ogle of Berwick. Who received the horses and what was their social status? A number of those who received horses were listed as servants to lords, ladies or abbots. Most of those taking the oath and receiving horses in return had no title, but some ranks are given. Three knights took horses themselves – Sir William Percy, Sir Hastings and Sir John Louther; the Constable of Carlisle Castle. Also mentioned are John Leghe; one squire; one gentleman; one household servant; seventeen general servants to various lords and two serfs. It is interesting that one document can throw up so many questions but still provide us with fascinating and pertinent information which all adds to our knowledge of the battle’s aftermath. Location still to be determined but 1 possibly Garrigill in Cumbria. In the 16th Century a Nag was a small horse trained for riding. A welsh pony with a good temperament, hardy with powerful limbs and a free-moving gait. Complete Cow Doctor by Joshua Rowlin.